My youngest is sick with a nasty cough. I got myself a flu shot in the fall and, so far, I’ve remained unaffected. This year’s daily photography project has no formal framework for the photos I take. Unlike the last project when I used a daily prompt to inspire my photos, this year I’m making it up every day. In this project, I am seeking to cultivate my photography skills and share some of my life and thoughts at the same time. I’m making it a kind of personal journal and creative expression all in one. So far, my subjects have come to me fairly easily and I’ve taken the photos using whatever technical and creative aspects happen to strike me at the time. Today is not that much different. Last night, I was inspired by a weekly photo challenge to look for ways to bring color harmony into my images this week. I’m not directly participating in this challenge, but I am grateful to it. A little technical inspiration and something to learn more about each week never hurts. So, I looked for ways to bring color together in my photos today. Then, I made tea for my youngest and myself. She likes it with honey … a lot of it. I thought that might make an interesting photo if we could get the honey to drip just right. I didn’t actually give that much thought the color harmony here, although I do like how the color of tea and the colors in the honey and tea bag play with each other. I setup the shot and my youngest tipped the spoon and that’s how we made this photo together. I do appreciate the help. Love the way the light hits the honey and the spoon. It’s as though it is catching the sun itself. 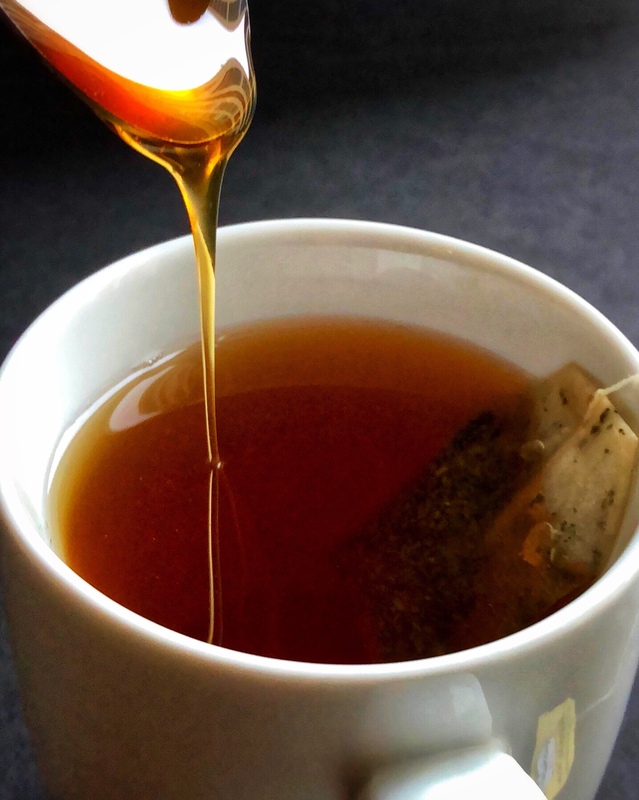 I like a bit of honey in my tea especially when feeling low or having a sore throat. I thought the same thing about the sun in the honey. It worked out so nicely.